To prevail on a claim for copyright infringement, a plaintiff must demonstrate: 1. That copyright subsists in the work of authorship that is the subject of the claim; 2. That he/she/it “owns the copyright” – more precisely, that he/she/it is the “legal or beneficial owner of an exclusive right under a copyright” and therefore “entitled, subject to the requirements of section 411, to institute an action for any infringement of that particular right committed while he or she is the owner of it” (§501(b)); and 3. That the defendant’s actions, taken “while [Plaintiff] is the owner of [that exclusive right],”id., violated (“infringed”) “that particular right.” Id. See also §501(a) (“Anyone who violates any of the exclusive rights of the copyright owner as provided by sections 106 through 122 . . . is an infringer of the copyright”) [Question: What words have I omitted in those ellipses?]. ￼in the window of her storefront on Market Street. Assume that (a) the work is protected by copyright, and that (b) the artist Shepard Fairey (or somebody else, whomever it may be) owns the entire copyright (i.e., the entire bundle of §106 rights) in regard to the work. Question: Is Alicia infringing? The first step requires the copyright owner to show which of his/her exclusive rights were violated by Alicia’s actions. Nothing in the facts suggest that she “reproduced the work in copies”; that is, there’s nothing to suggest that she started with one copy of this copyrighted work and made a second copy. Nor does it appear that she created a “derivative work” based upon the copyrighted work, or that she “distributed copies” of the copyrighted work to the public. [Do you see why not?] This work is not a “literary, musical, dramatic, or choreographic” work (is it?? ), nor is it a “motion picture or other audiovisual work”; therefore, the copyright owner does not own the exclusive right to “publicly perform” the work. (See §106(4)) [What kind of a work is it??] The most plausible argument the copyright owner has is that this action by Alicia violates his/her exclusive right to “display the copyrighted work publicly.” This will require showing that Alicia “displayed” the work (did she? see §101’s definition of “display”) and that she displayed it “publicly.” (Did she? See id.). That’s the first step of the prima facie case – “The defendant’s actions fall within one or more of my exclusive rights.” There are, however, two additional steps that are not as clearly set forth in the statutory text. First, the copyright owner must show that the defendant “copied” from the copyright owner’s work. This is a very unfortunate choice of words, but it is deeply ingrained within copyright law and we’re stuck with it. It’s unfortunate because the Copyright Act expressly defines the word “copy” as a noun; a “copy” is a “. . . material object[ ], other than [a] phonorecord[ ], in which a work is fixed by any method now known or later developed, and from which the work can be perceived, reproduced, or otherwise communicated, either directly or with the aid of a machine or device.” §101. But here, as used within the copyright infringement inquiry, “copy” is being used as a verb: If the defendant did not “copy” from plaintiff’s work, there is no copyright infringement claim, no matter how similar defendant’s work may be to plaintiff’s. What does it mean to say that Alicia “copied” from plaintiff’s work? It does not mean that she “reproduced” it. Rather, it means that the work Alicia displayed contains expression that was “taken” from plaintiff’s work, and that therefore the similarities between the work that she displayed and plaintiff’s work are not due to coincidence, or to independent development. 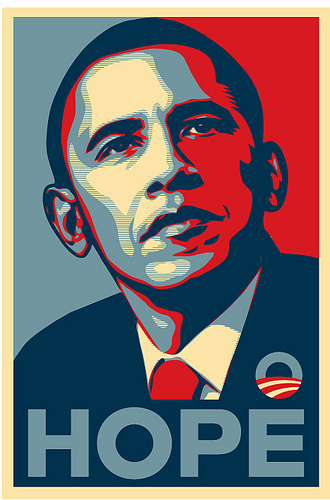 That is, if Alicia had never seen Shepard Fairey’s “Hope” poster but instead came up with the work she displayed on her own, there’s no infringement claim against her. It is plaintiff’s burden to demonstrate that the poster Alicia publicly displayed in her window is, in fact, his poster – that it was derived from the copyrighted work. [As you read the cases in this section, focus on how courts figure out whether or not the defendant “copied” from plaintiff’s work.] Presumably, this will be easy enough to show in this case – but without additional facts, we can’t be entirely certain.